How to Remove Duplicate Images with VisiPics? Step One: Download VisiPics and install it on your conputer. 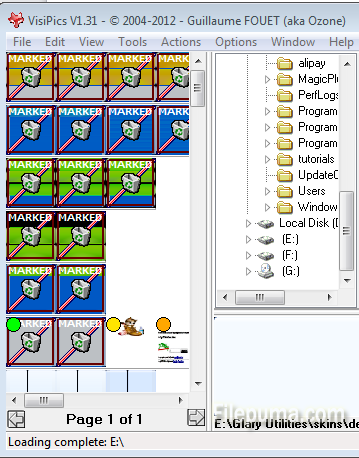 Step Two: Launch the program and click + on the left top to specify which directories you wish to scan. Step Three: Set the Filter slider to Strict, Basic, Loose, or somewhere in between. 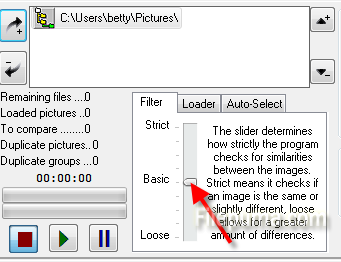 This determines how strictly you wish VisiPics to compare the files. Step Four: Click the green arrow in the middle to begin the scanning. When the scanning finishes, you will see a list of duplicate images on the left side. Step Five: Select the ones you want to delete and click “Delete” to remove all the duplicate ones.